If you have been somewhat (or totally) confused about the cost of the new high school as a homeowner/ taxpayer, you are not alone…. I have attended all of the public meetings on the School Building project in order to provide commentary here on the LongmeadowBuzz blog but came away confused from the last public forum on February 11. Below is a summary of what I have learned since this forum. For the "average" homeowner with an property assessment of $350,000.. The average tax increase will be $532/yr (mil rate increase = $1.52/1000) for the first 10 years (FY14 - FY23) after new high school is opened. This compares to the $450/yr for 25 years (duration of school bond) figure that was presented at the 2/11/10 forum. Click here to look up your current FY10 property assessment so that you can calculate your increase in future property taxes. The estimated tax increase was ~ $1.00/ $1000 (mil rate increase) of property assessment or ~$372 for an average $370,000 home. However, at the latest School Building forum on February 11, the average taxpayer annual increase presented appeared to increase signficantly even though the town’s share of the project cost had shown only a small increase ($44M --> $46 million, + 4.5%). 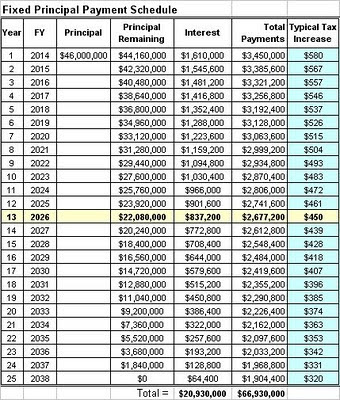 Note 1: Tax increases for FY11 --> FY13 are low because the school project construction will not be completed until FY14. In the first three years (FY11 -> FY13) only interest on the borrowed money is being paid. In FY14 the construction loan will be converted to a 25 year municipal general obligation bond and the full tax increase will be realized. Note 2: Because of lower property values for the current FY10, the average home assessment is now $350K (vs. $370K). The average annual tax increase for a typical $350,000 home over 25 years is estimated to be ~$450/year which translates to a mil rate of $1.28/ $1000. At this point I was confused and had a couple of questions…. 1. Did the average taxpayer cost of the project increase by 22% from Sept 30 to Feb 11 ($370 --> $450)? 2. Why was the average taxpayer cost for the first four years after completion of the project now $563 or $1.61/$1000? Was that a 52% increase ($370 --> $563) from the Sept 30 estimate? I asked Paul Pasterczyk, Longmeadow’s Finance Director and a member of the School Building Committee and Christine Swanson/ SBC- co-chair for some clarification. 1. The September 30 forum number was miscalculated and wrong! 2. The latest tax increase estimates which varied each year (higher beginning in FY2014 and lower at the end- FY2038) were based upon a fixed principal repayment bond repayment scenario vs. a constant debt service bond scenario. It should be noted that the quoted $450 average tax increase does not occur until FY2026! To further understand this numbers, I calculated the year by year the tax increase for the two bonding scenarios and the results are shown below. For this first bond scenario the average tax increase for the first 10 years is $532. The second spreadsheet shows a constant debt service or tax increase of $469/year (mil rate increase = 1.34) for property owners. 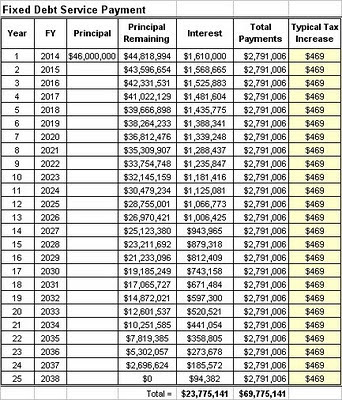 Total increased tax payments by the "average" taxpayer over the term of the 25 year bond ranged from $11,250 (scenario #1) to $11,729 (scenario #2). While I do not want to handcuff our bonding process, it would seem to me that the second bond scenario that provides for lower taxes in the first 10 years would be the preferred option for taxpayers. I am interested in accurate estimates of the cost for our new high school. I would also ask the School Building Committee to present the taxpayer information in a more upfront manner. Quoting the FY11 --> FY13 tax increases as part of the tax increase picture is OK as long as we don't use it to minimize the cost that we will incur for many years to come. By the way.... let's not forget the $750,000 that we have spent for the current planning/ design phase that is now bonded for 5 years at an average taxpayer cost of $30/year. Last Thursday, the Longmeadow School Building Committee (SBC) hosted a Public Information Session to update town residents about the new high school building project. If you were not able to attend or watch the session on LCTV it is available via webcast on the SBC website. A press release from the SBC released yesterday is also available. Below is a short video clip (9 min) from this meeting with Christine Swanson, SBC co-chair summarizing the financial aspects of the project. Ms. Swanson also included a slide showing the cost to taxpayers by year…. The average tax increase for a typical $350,000 home over 25 years is projected to be $450/year which translates to a mil rate of $1.28/$1000. One of the comments made during Ms. Swanson's presentation was that the projected tax increase for town residents for the first three years FY11, FY12 and FY13 is pretty low as shown above. It is not until FY14 that a significant tax increase shows up which is due to the fact that this is a construction type loan and construction is not expected to be completed until Sept 2013. It is interesting to note that the mil rate impact in FY14 is 1.66/$1000 or $580 which is significantly higher than the average over the 25 year bond period. Ray McCarthy, a town resident commented (see short video clip below) that the committee should not sell this building project based upon the low upfront tax impact but it should make sure that town residents understand the significant long term impact on their taxes. I definitely support Mr. McCarthy's recommendation in this regard. I disagree with a comment made by SBC co-chair Mr. Barkett during this meeting. He stated that some of our debt from other capital projects will be maturing over time reducing the town's outstanding debt obligations and therefore mitigating some of the high school project tax burden. With all of the potential future capital projects that our town may need in the near future including a new DPW facility, water/ sewer upgrades, we should not count on the town's overall outstanding debt disappearing anytime soon. Stay tuned to LongmeadowBuzz for further developments on this important project.